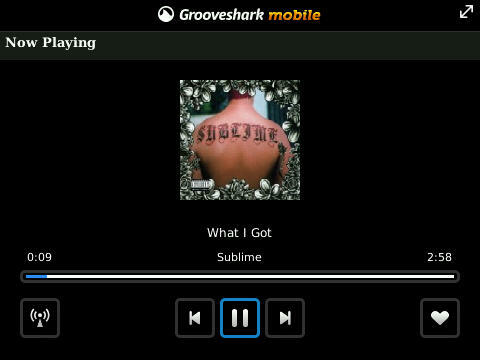 Grooveshark is a music streaming application that compares to Pandora and Slacker, but also differs from them. Let me start out by saying that Grooveshark is not free if you wish to use on your BlackBerry, it requires a VIP pass that costs $3 per month. That being said, it is worth every penny in my opinion. The application does have features like radio stations based off of your favorite music, but is not totally centered around it. You can simply play any song you wish instantly, then search for your next song/album an "add/add all after current song" which really gives you the feeling of total control over your music. Grooveshark also features multiple custom playlists, favorites, and making songs accessible offline for those places where your service is not so good. Overall I think Grooveshark is a great app that sets itself apart from the rest with its song and album playing features. It is available for all BlackBerry's running OS 4.2.1 and requires a 3G/Wi-Fi connection to stream/cache music. As an added bonus Groveshark is available in Canada and (from what I can tell) most countries as well. You can download directly to your device from grooveshark.com. If you give it a try, be sure to share your thoughts in the comments.